Departing Brazil technical director Carlos Alberto Parreira has warned the country's football federation (CBF) against appointing a foreign coach. Luiz Felipe Scolari stood down as the Selecao's coach after their World Cup dream fell apart in a 7-1 semi-final hammering by Germany, followed by another defeat to Holland in the third place play-off. His backroom staff left with him and attention will now turn to finding a successor, with suggestions a first ever overseas appointment could be on the agenda. But Parreira, like Scolari a former World Cup-winning Brazil coach having led them in 1994, wants to see another home-grown coach. "Great teams have to have a local coach," Parreira told ESPN Brasil. "If somebody from another country takes the job, he is going to suffer a lot. And when he starts to get it, it will be too late." "I'm not against the idea but I think it will be difficult for a foreign coach to implement his ideas. In six matches, if he loses three, people are going to criticise him." "I think there are competent people here who can do the job." Sao Paulo's Muricy Ramalho and former Corinthians coach Tite are among the Brazilian coaches linked with the vacancy. Manchester City's Manuel Pellegrini, from Chile, is reported to have rejected advances from the CBF but Parreira pointed to England and their experience with high-profile coaches from abroad as a cautionary tale. "Sven-Goran Eriksson was a failure and Fabio Capello was an even bigger failure," he said. 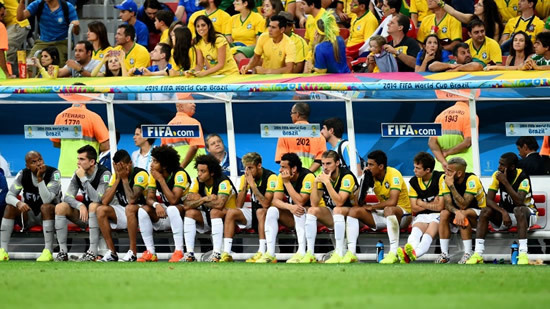 Even a semi-final place was arguably a good achievement for a below-par Brazil squad and Parreira admits much work is needed to find the next generation of players. While the defence bore the brunt of the criticism for their calamitous display against Germany, Brazil's striking options also struggled. Fred retired from international football after the tournament having become the target of fans' criticism, while Hulk and Jo fared no better. "Brazil always developed young players, we have to go back to doing that," said Parreira. "We need to work harder at developing youth football and produce high-level players." "Players are leaving too early. They currently complete their football development in other countries." Notice: Please subject to GMT+0800 (Beijing Time) if there are no other time zones marking in our info. Copyright © 2003 - Power By www.7msports.com & Press Association All Rights Reserved.